Today’s one of those days where that little voice in my head is screaming, "Thank goodness it’s Friday!". Tomorrow, Dan will be home and it will be back to tag-team parenting. It has just been one of those mornings where my two oldest girls are out of sorts and the bickering has been non-stop. One moment it all just plain drives me crazy, and the next moment I’m questioning all of my parenting techniques wondering where I’ve gone wrong that I’ve raised girls who can be so mean to each other. It’s almost like they’re bi-polar or have dual personalities–in the same breath that says, "I’m going to hit you in the head!" (yes, it’s embarrassing to admit that my child actually said that this morning), the next breath can be a sing-songy voice saying, "Do you want to play horse doctor with me?" Where does it come from? What makes one day so much worse than another? How do I deal with it without throwing my own anger and lack of patience in the mix? Sorry to say, I have no answers today. wow…as unpleasant as the situation sounds, the photos make me want to have kids. i wish i could offer you a piece of advise or answer, but it sounds like you just need a little break. i think kids in general are a little bi-polar. atleast my sisters and i were at that age. oh my girls talk nasty and mean to each other all the time and i hate it! really hate it! but they do the same as yours, they turn around and are best friends. that i love. Oh, I’ve had a week like that, too, Molly. 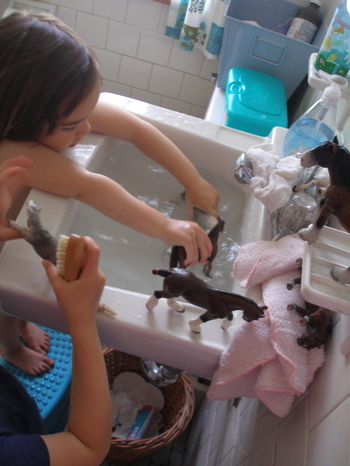 Here’s to more sinks full of water and horses, and some inner calm and patience. Take care. I totally understand, and I don’t have a newborn. I’ve been thinking of you guys and I hope it will get easier each day. Oh, dear one. Be kind to yourself. We all have those days, especially when mama is tired and flexibility is limited. Thinking of you and hoping you have a bit of calm this weekend. 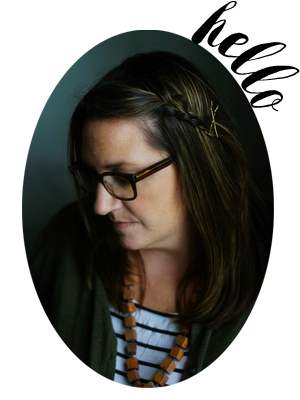 I was the same age as your eldest (I think that’s your eldest) when I took horseback riding lessons–I had a pile of model horses, too, when I was little. Oh, how I loved them. Some of my fondest memories are from those years. So chin up! She’ll look back on it with tenderness, even if she can be a little hostile now. I can only comiserate and say I’ve been there (sort of, because I only have two), but I will say that last night, watching my kids in the stands at Peter’s race, I’m realizing how big they are suddenly. Full of control that came from somewhere, I thought they’d never get it, but they did. Someone once told me, “Where can kids try out harsh words to see what kind of reaction they will get if they can’t try them out in the safest place in their world, home?’ I guess I get that. Hang in there dear. You’re doing great. Hope you’ll have a lovely, relaxing weekend!Happy Mothersday!! I have four sisters. We have been mean to each other since we were little. Nobody knows how to yank your chain like a sister. Luckily these things are (mostly) outgrown… I wouldn’t worry about it too much in the meantime. I’m with Blair up there: I think kids need to test people to learn how far they can be pushed, and they do it in the safest place they can. I know my sister and I were sometimes awful to each other, but we always made up, and no harm done. Take care! I’m gearing up for two, but can’t even imagine three. I know you are doing your best though! Take care! I’m gearing up for two, but can’t even imagine three. They couldn’t have a more wonderful mother to help them through their lives and show them kindness so they are lucky girls. Just remember that when they get older they will be grateful that they have each other. But I can only imagine how stressful it is in the moment! Oh I so understand. hearing “I’m going to kick you in the head” come out of my sons mouth to his sister made me feel like I was doing something wrong. Then there are so many oth sweet things they do, so many more than the bad actually. My kids have been the same way to each other and it just kills me sometimes. I try to remind myself that they don’t yet have the skills or experience to work out those feelings of frustration and disappointment in a different way. They’re trying out ways to work through them and learning how to relate with other people. It doesn’t mean you’re a bad parent – there are just some things we all have to figure out on our own. And when it comes down to it, there are many adults who still haven’t mastered those skills yet, either. Looks like we have the same ponies!! Ours are named “Neigh” and “Hershel” (& don’t ask me why on the latter!) I feel the same as you on many days when K & N start bickering! Maybe we should start a club?! I actually lol at “I want to hit you in the face” followed up by “Want to play horse doctor?” OMG… motherhood! I can’t really help much in the department either. My 2 older ones do the same thing. One minute the are having a ball playing together then the next, it ain’t no fun at all. The only thing I can do and still keep my sanity and temper down is, have then sit on the couch together with there arms around one another and I leave them there. Usually after a few unpleasant minutes of them hating it, they soften up. My 4 have been horrid this week too. I wanted to lock them all out in the rain tonight (but I didn’t-of course). My eldest is nearly 13 so I’m still waiting for it to get better. I think they are worse when I am tired and run down. And I have no patience to sort it all out (hubby’s working late). 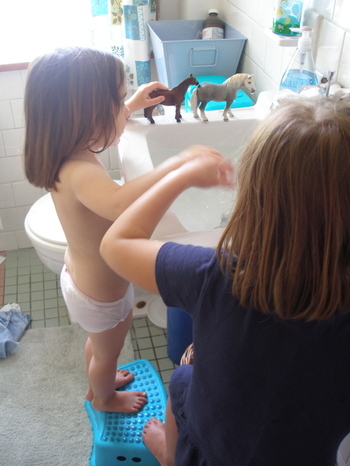 But we get through, don’t we…loved the idea of water play in the bathroom. Hang in there, you’re not the only one! I’m really empathizing with you because as it happens yesterday was one of my worst mommying days in a while. For no apparent reason, just that I got overwhelmed and burned out. And I only have ONE! Sometimes the whining just hits critical mass. Not that I’m recommending vodka as a cure for this, but when my husband came home I mixed a rare weekday lemon drop martini and just the idea of sitting down with a beverage was calming.